"You Can Fix All the World's Problems In a Garden"
"You can solve them all in a garden. 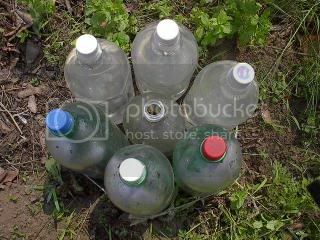 You can solve all your pollution problems and all your supply line needs in a garden. And most people actually today don't actually know that and that makes most people insecure." So says Geoff Lawton from the Permaculture Research Institute of Australia. He proves it here with a video describing how permacultural design and a local team desalinated the soil and grew a garden on 10 acres of barren desert land two kilometers from the Dead Sea. Within four months, the trees produced their first figs. "We could regreen the Middle East. We could regreen any desert...."
I think Candide would agree. I'm not sure about Voltaire. Here's a recycled solar cloche I found in Candide's garden. Thanks to worldchanging for alerting me to this permaculture story.